TOKYO--It’s the end of an era, and the new one already has a name. The Japanese government Monday officially unveiled the name of the imperial era set to begin May 1, the day after the current emperor, Akihito, abdicates. Akihito, 85, is the first Japanese monarch to step down in more than 200 years. As his reign ends so does his era, known as Heisei. The reign of each emperor is accompanied by a name for his term in power, and the era’s name becomes an important part of everyday life in Japan, as it is used to indicate the date on all official documents. 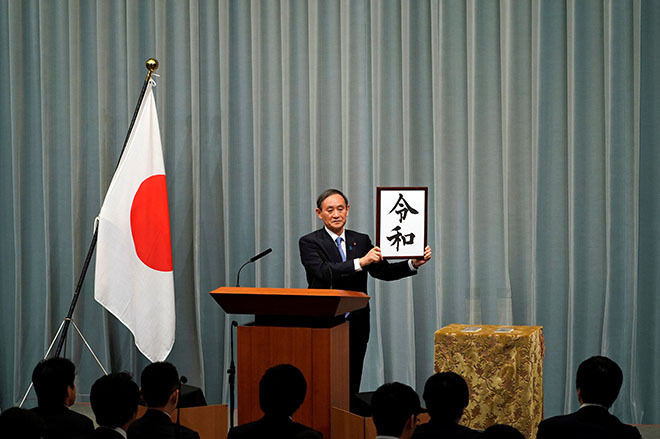 At a news conference Monday, Chief Cabinet Secretary Yoshihide Suga dramatically revealed a calligraphic rendering of the name for the era of the incoming emperor, Naruhito, 59, the current crown prince. Naruhito’s reign will be called Reiwa, a term with multiple meanings, including “order and peace,” “auspicious harmony” and “joyful harmony,” according to scholars quoted in local news media. Naruhito is slated to become the 126th emperor of the world’s oldest monarchy. The current imperial era known as Heisei--roughly translated as “achieving peace”--was chosen the day that Akihito’s father, the wartime emperor Hirohito, died. In addition to choosing the imperial era’s name a month before Naruhito takes the throne, Japan broke with tradition in another way: The government selected the word Reiwa from a collection of Japanese poetry rather than classic Chinese literature, as had been the custom. As soon as Reiwa was announced, pundits immediately jumped to define the word, a task made difficult by the nature of Japanese kanji characters. Prime Minister Shinzo Abe said the name had been chosen from Japan’s oldest collection of poems, an eighth-century anthology known as the Manyo-shu, and referred to a verse about the budding of plum blossoms after a harsh winter. “The era name is based on the long heritage of the imperial family, the stability of the state and the happiness of the people,” Abe said, declining to give details of how the name had been chosen or what the alternatives were. According to Japanese media, the Cabinet selected the name from a shortlist after consulting with a panel of nine experts, which included Shinya Yamanaka, a stem cell researcher and Nobel laureate, and Mariko Hayashi, a novelist and one of two women on the panel. Neither the emperor nor the crown prince had any say in the decision. “Like the plum flowers that beautifully bloom, heralding the arrival of spring after a severe winter, each one of the Japanese people can bloom their own flowers with a hope for tomorrow,” Abe said. In selecting a name from Japanese, rather than Chinese, literature, the government made an “unquestionably significant” choice, said Kenneth J. Ruoff, a historian and specialist in Imperial Japan at Portland State University. “He went out of his way to emphasize that this is Japanese tradition,” Ruoff said. Thousands gathered in public spaces around Tokyo to await the revelation of the name. Newspapers rushed out special editions commemorating the naming of the next era. In Tokyo’s Shinbashi neighborhood, Japanese salarymen wrestled each other for copies of the paper, headlined with the new era’s name in giant Japanese characters. Nearby, people formed a more orderly line for bottles of Coca-Cola branded with the new era’s name. An elderly man standing nearby showed off a bruised cheekbone he said he got in the free-for-all. “It’s really too much,” he said. Businesses, including toy companies, calendar makers and official stamp producers, rushed to introduce versions of their products featuring the new era’s name. One of the most popular orders now at Shachihata, one of the largest makers of stamps used on official documents, is a stamp with double crossed lines that can be used to cover the previous era’s name on documents until new stamps are released. “It takes time to carve rubber materials,” said Hirofumi Mukai, a company spokesman. Ben Dooley, Makiko Inoue and Hisako Ueno contributed reporting from Tokyo.